Caloundra accommodation with genuine customer service! Reasonable rates for a one night stay or longer. We are within minutes walk to the beach, our famous surf break at Moffat Headland, parks with playgrounds, bbq’s, a variety of cafes, art galleries & restaurants. Pet friendly accommodation minutes walk from Caloundra’s only doggy beach. Affordable Sunshine Coast accommodation in a beach suburb! If you can stay longer and enjoy our fantastic location we will service your room daily free of charge. 24 hour check in is available – please notify us prior to late arrival. Book now….pay when checking in! We welcome families to our Caloundra motel and have special rates for travelling reps or tradesmen who want to avoid the dreaded commute. Corporate accounts at competitive rates & charge back facilities. We are always upgrading our linen, paint, furniture & guarantee our rooms are very clean and comfortable! 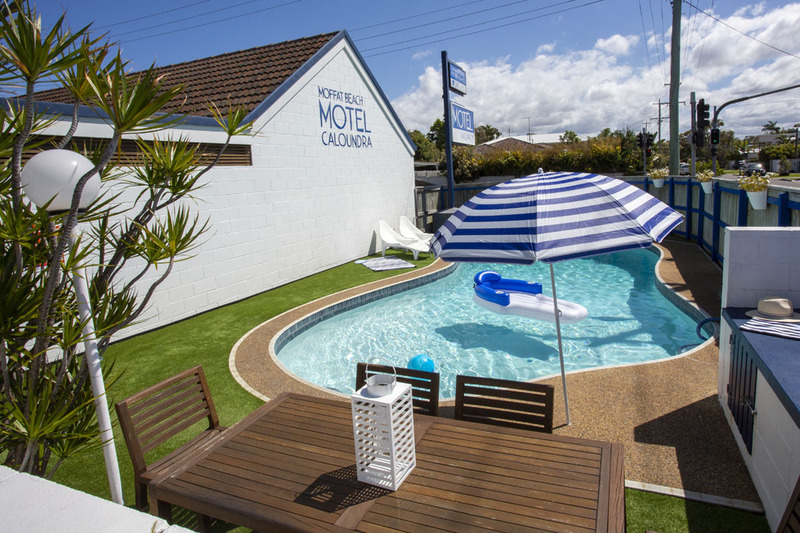 Our Caloundra motel near Moffat Beach is a safe & quiet position away from the noisy highway and busy main roads. Courtesy buses will pick-up and deliver you to our door from Caloundra RSL & local Surf Clubs. We’re a 12 room Caloundra motel which books out quickly, especially on the weekends, so please contact as soon a possible with your accommodation enquires. 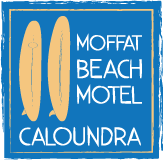 Discover our Moffat Beach Motel….you will not be disappointed! If attending a funeral in Caloundra, we are minutes from the Gregson & Weight Crematorium, Caloundra Catholic Church & the cemetery. The Sunshine Coast University Hospitals (Public & Private) are only 7 klms / 10 minutes drive from our location. Going to a sports event held at Sunshine Coast Stadium? 8 klms / 12 minutes drive from the Moffat Beach Motel Caloundra front driveway. The Caloundra Events Centre is also very close to our venue – dance eisteddfods / theatre / musicals and entertaining shows are 3 minutes in the car, under 2 klms from here.